Ben Affleck was born on August 15, 1972 in Berkeley, California, but was raised in Cambridge, Massachusetts. He was born to parents Tim Affleck, a social worker, who is now divorced from Ben's mother Chris Affleck, a school teacher. Ben also has a younger brother, actor Casey Affleck, who was born in 1975. Ben wanted to be an actor ever since he was very little and his first acting experience was for a Burger King commercial when he was just 12. It was also at that time, when he met his lifelong friend and fellow actor, Matt Damon. They played little league baseball and took drama classes together. During Ben's teenage years, he starred in a few small TV appearances but nothing big. He made his debut into feature films in 1993 when he was cast in the movie "Dazed and Confused." After that, he did mostly independent films like Kevin Smith's "Mallrats" and "Chasing Amy" which I love. The success didn't last and he was getting frustrated (and broke), living with his brother Casey and Matt. Matt shared his frustrations with his own career as well, and it wasn't long until they decided to write their own movie script so they could call the shots. So, after finishing the script for "Good Will Hunting", they shopped it around until Kevin Smith brought it to a studio who would allow the 2 friends to have complete control over the movie. "Good Will Hunting" was released in December 1997 and Ben Affleck and Matt Damon (2 relative unknowns at the time) became "overnight sensations" (sort of). The film was nominated for 9 Academy Awards and won two, including Best Original Screenplay for Ben and Matt. The film marked Ben's breakthrough role, and he was finally given the chance to choose roles instead of having to auditions for parts. After his high profile relationship with actress Gwyneth Paltrow, his relationship with actress/singer Jennifer Lopez attracted worldwide media attention in which Affleck and Lopez were collectively known as "Bennifer." Following their breakup in 2004, he began dating Jennifer Garner. 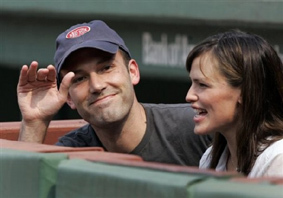 The two married in June 2005 and welcomed their first child, Violet Anne Affleck, in December 2005. They have since had a second baby as well. Ben Affleck has been actively involved in politics, along with a non-profit organization called the A-T Children's Project. Ben and Matt still hang out together and have a production company called LivePlanet. In 2004, Affleck actively campaigned for Democratic presidential nominee John Kerry. During the first day of the Democratic Convention, he was featured on Larry King Live with Tucker Carlson and Al Sharpton. I watched the episode and was pleasantly surprised how well spoken and knowledgeable he was regarding politics. Larry King asked if he would consider running for office, and Affleck admitted that the thought did cross his mind. So, maybe one day he will be a Senator for his home State of Massachusetts. Ben and Mat are HUGE Boston Red Sox fans and Ben is frequently seen at the games in Boston. Nowadays, Ben visits his mother at her Cape Cod house he bought her in Truro and has settled down with Jennifer Gardner. They seem like a really down to earth couple.